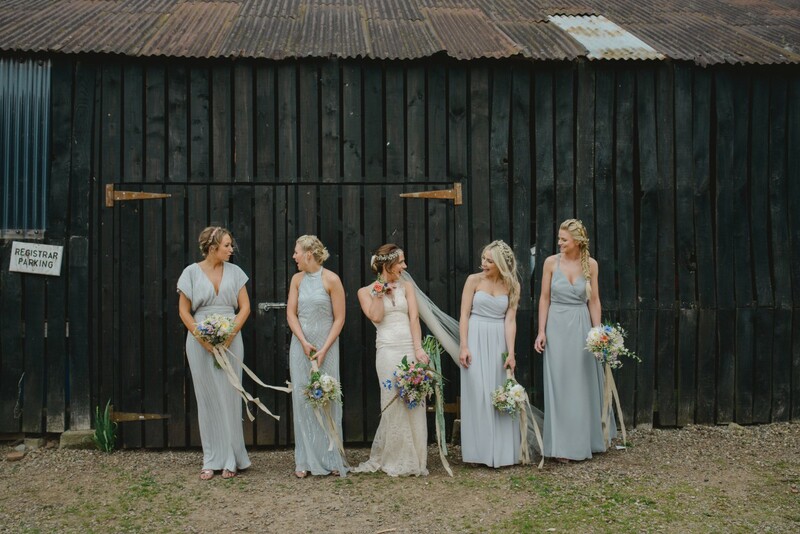 That may sound a bit OTT but I promise you when you see the images of Emily & Matt’s special day by the lovely Camilla Rosa Photography you’ll agree, and that’s before you’ve even taken a peek at the stills and video by the über-talented duo the Costa Sisters! 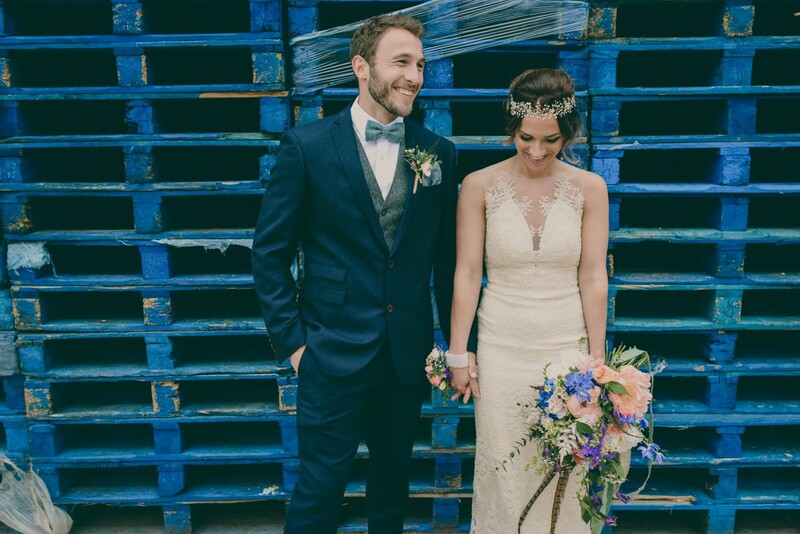 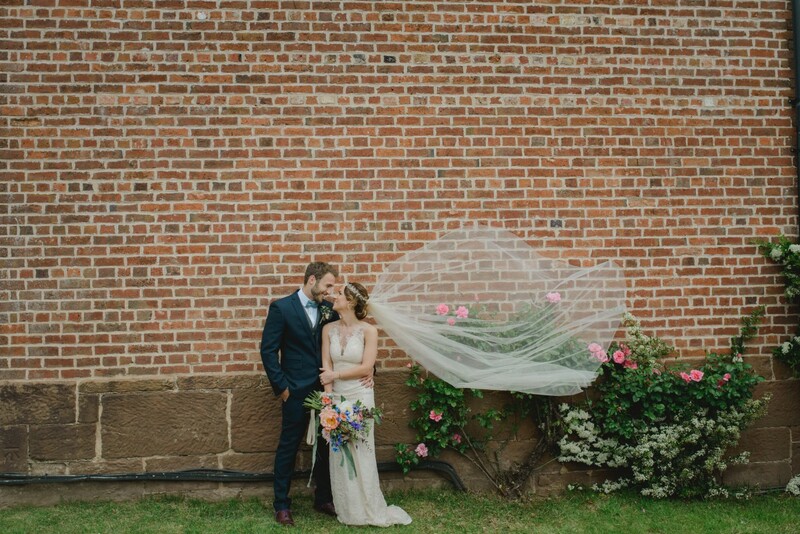 As soon as we met at The Curradine Barns I totally clicked with Emily and Matt and their vision for their day filled with love and unique details. 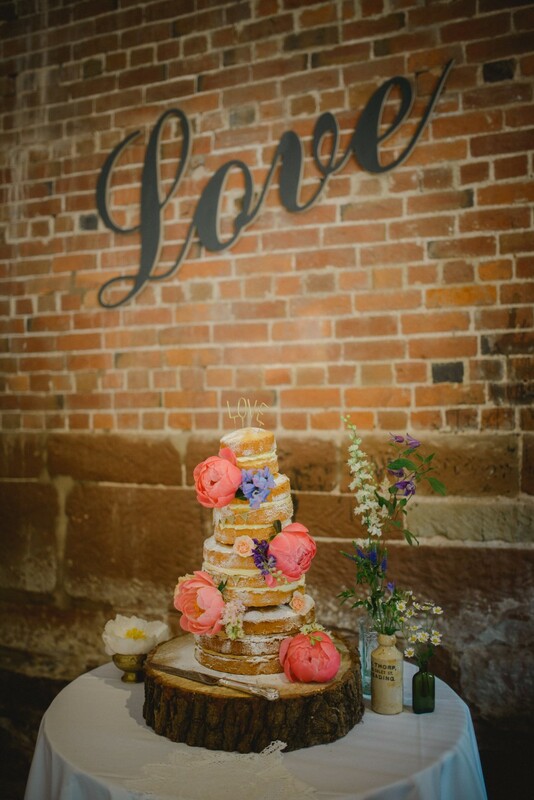 Emily wanted to include a mix of bright corals and pinks, with cobalt blues, purples and some softer pastel creams and greens. 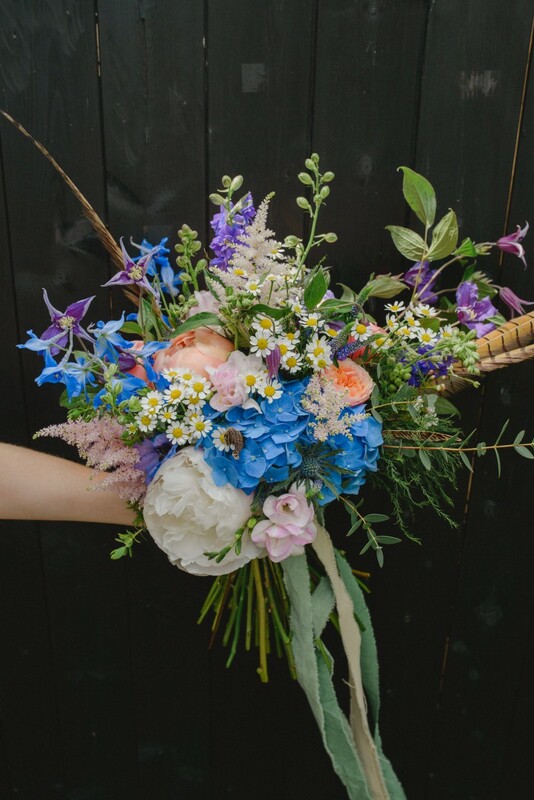 Having a May wedding they were spoilt for choice on gorgeous seasonal flowers to use including peonies, delphiniums, larkspur, daisies, clematis, garden roses and astilbe which all went into a loose-unstructured bridal bouquet, along with a few pheasant feathers to add a quirky touch and tie in with some of the other detailing. 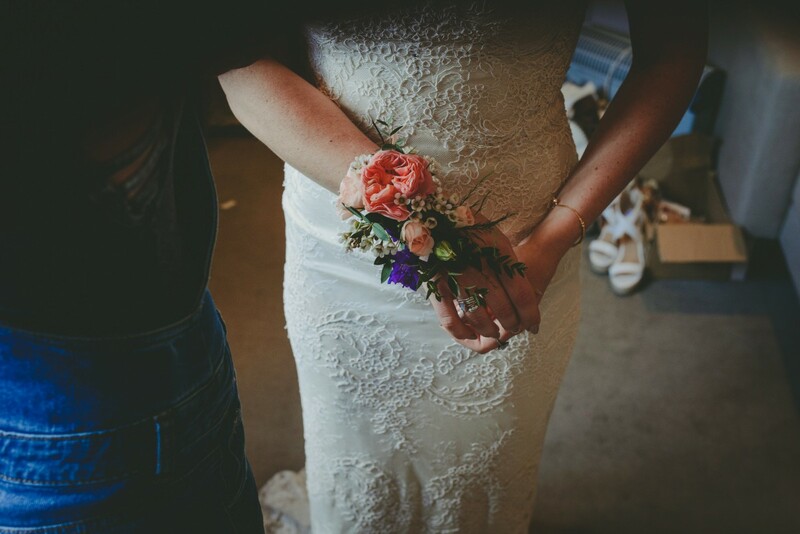 Emily wore a wrist corsage featuring coral and peach roses, waxflowers and purple larkspur as well as a crown of dried flowers made by her talented friend. 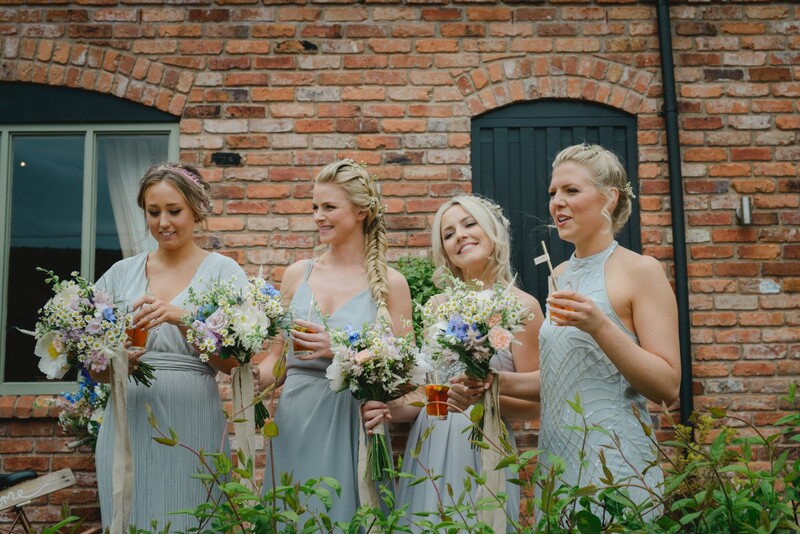 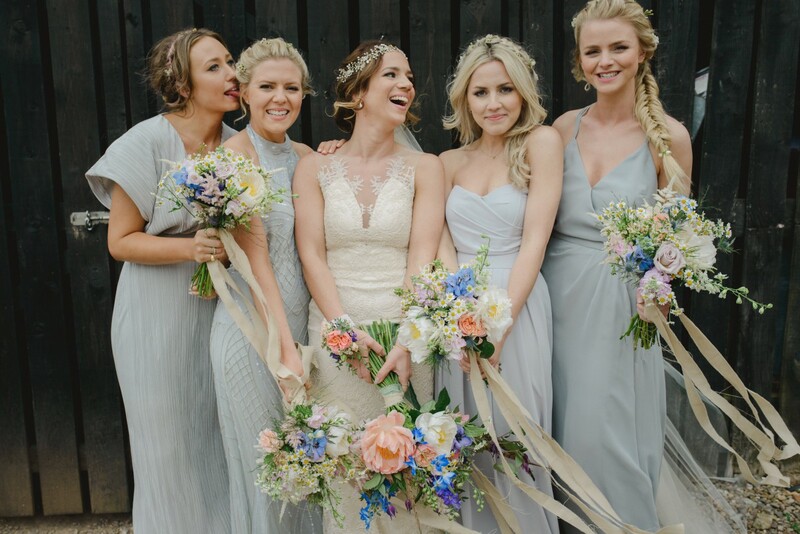 Emily’s gorgeous girls wore pale green dresses and had hand tied bouquets in paler colours to tone with the dresses. 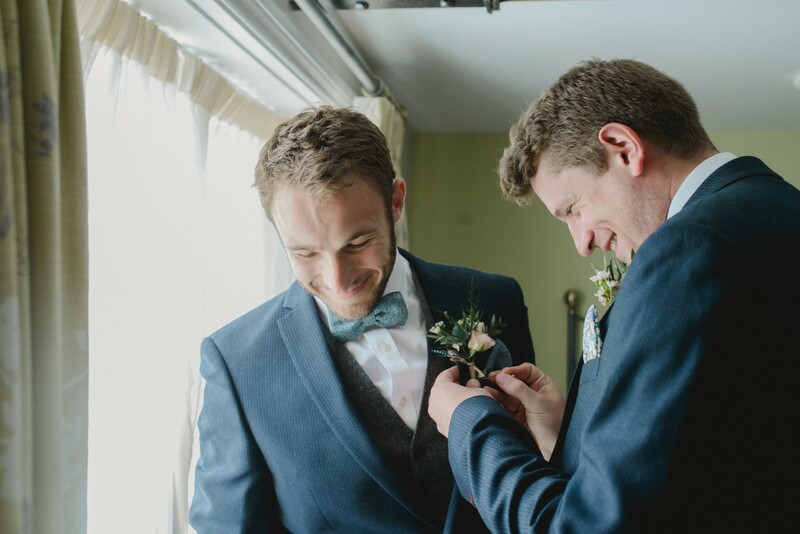 Matt and his groomsmen had a rustic buttonhole with thistles and feathers, I even found a little blue jay feather to go in Matt’s buttonhole, which tied in perfectly with the blue flowers in Emily’s bouquet! 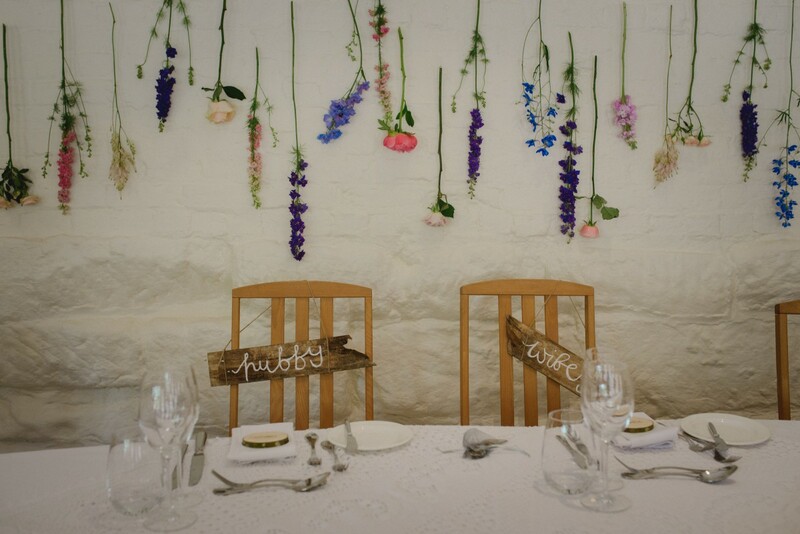 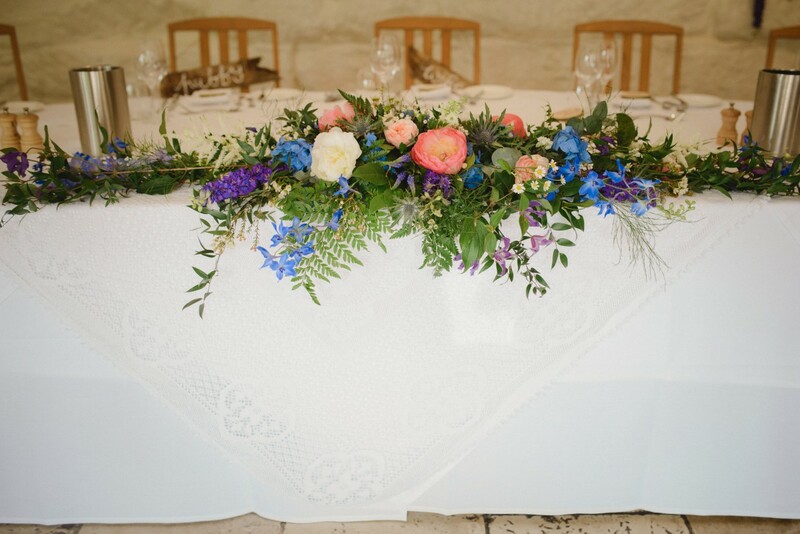 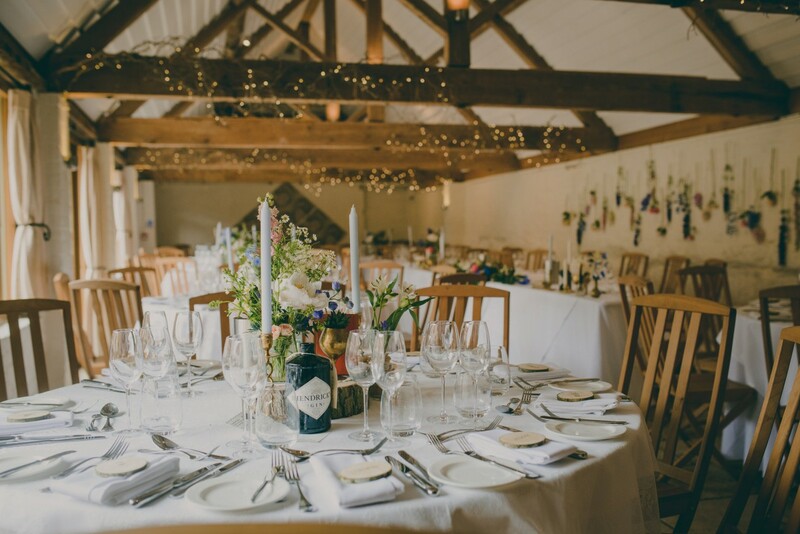 The barns at Curradine lend themselves to rustic, natural flowers and I was super-chuffed that Emily and Matt went for floral designs a bit different from the norm! 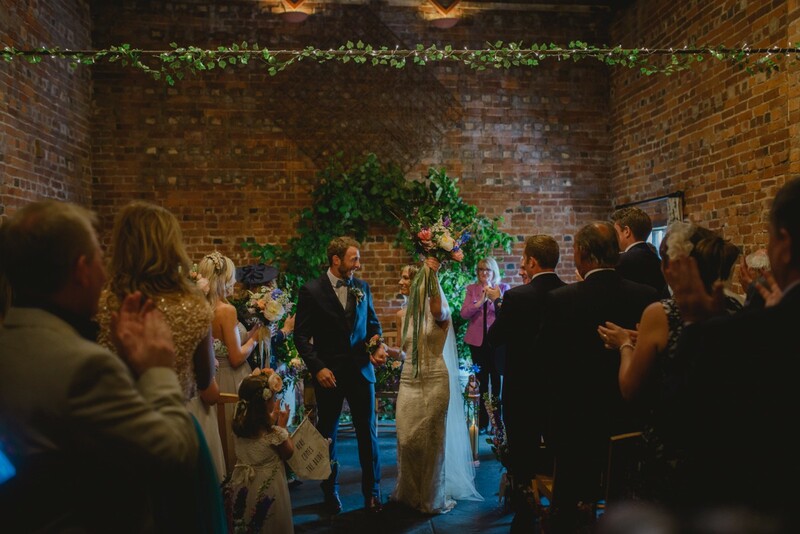 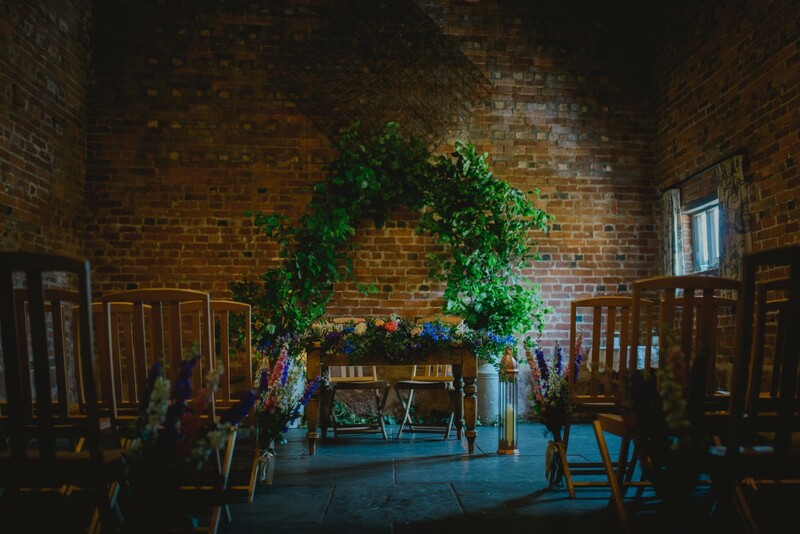 First up I decorated the front of the ceremony room with a big arch made from boughs of hazel in milk churns, we backlit it with up lighters and it looked fab against the rustic brick. 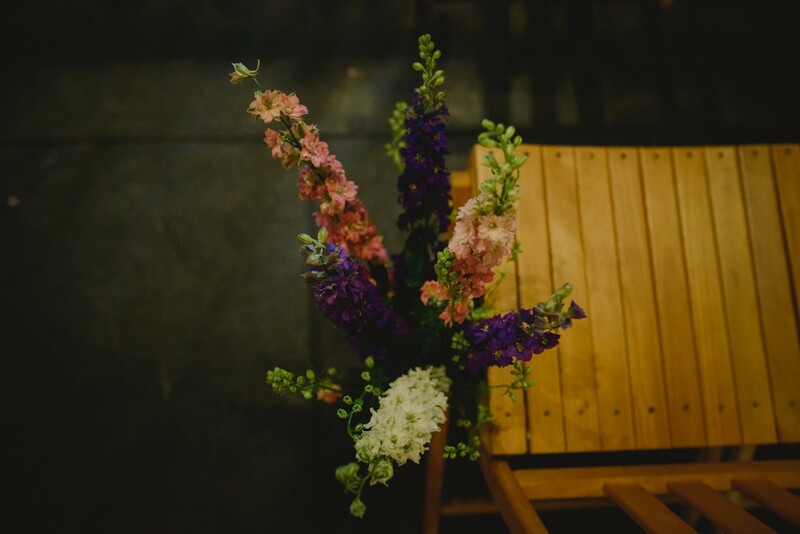 I created a long, low arrangement for the ceremony table which they then moved to the top table and also did something a little different for the ‘pew ends’ – bunches of larkspur in pinks, purples and whites tied to the legs of the chairs. 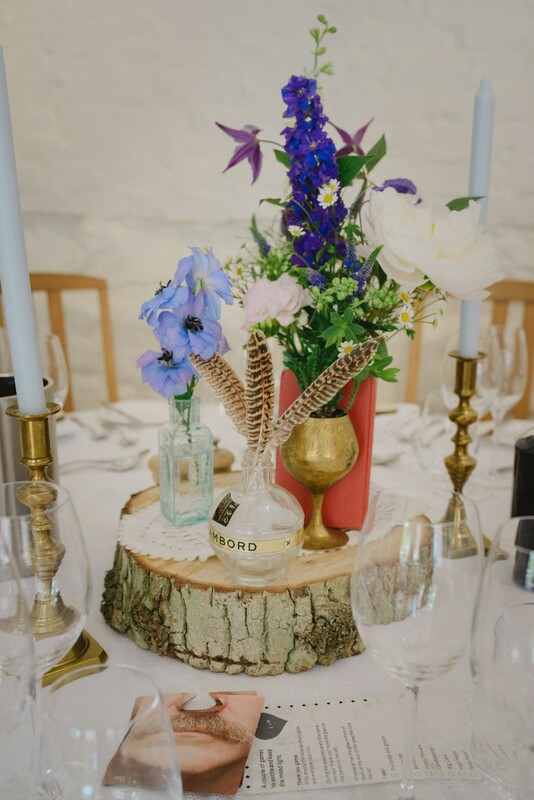 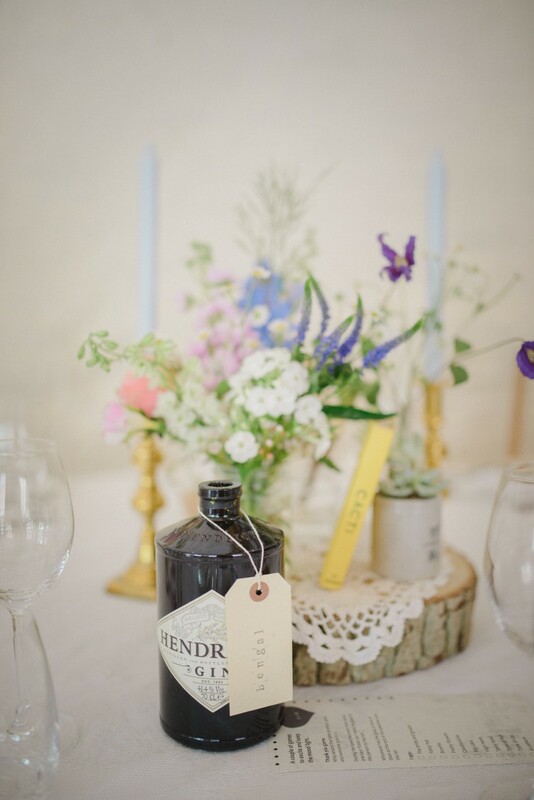 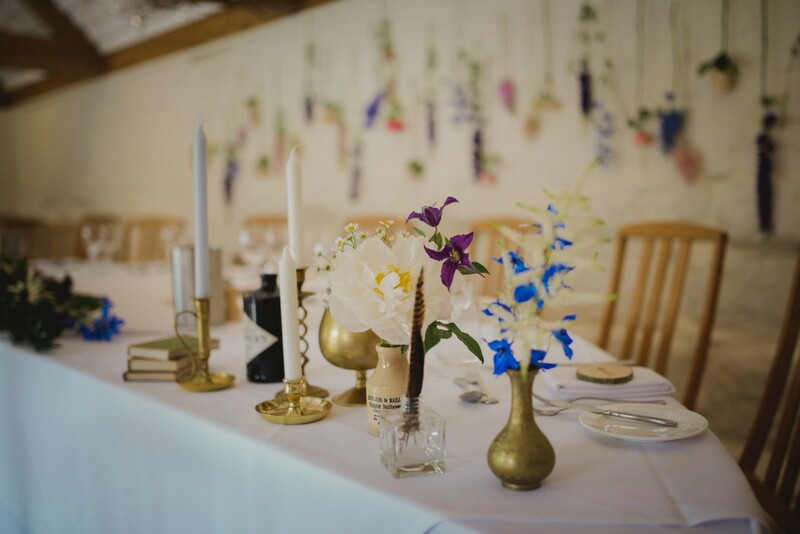 For the reception Emily had collected a fabulous array of vintage bottles, brassware, candlesticks and vases with feathers which stood on log slices with a gin bottle for the table names. 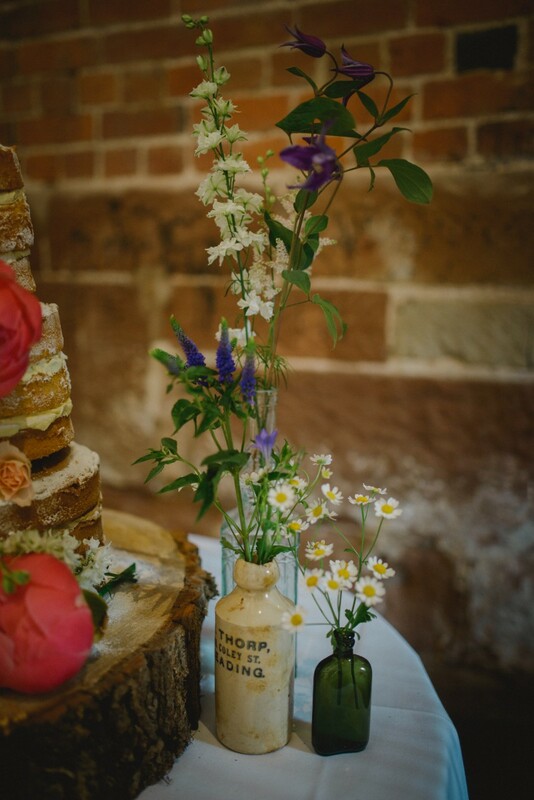 I filled the bottles and vases with a mix of flowers for a relaxed, natural look. 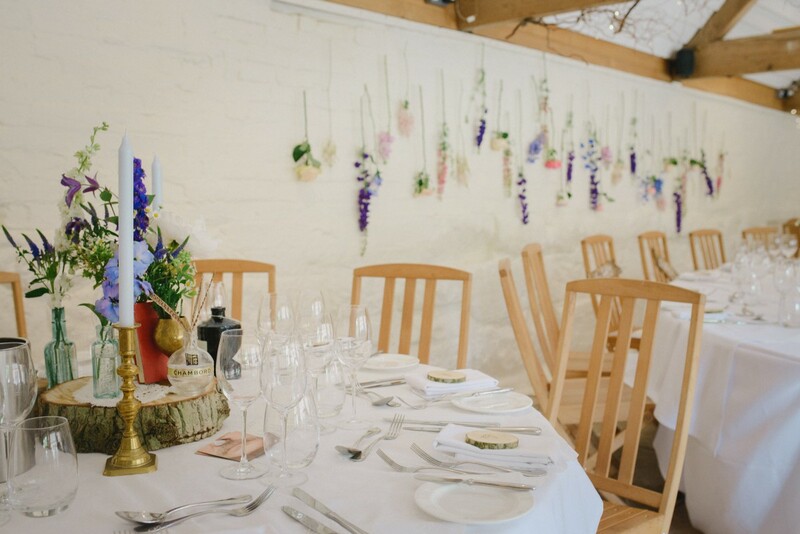 Another feature for the reception was the colourful hanging flowers behind the top table which looked fab against the whitewashed wall and provide a pretty backdrop for all the photos during the wedding breakfast and speeches. 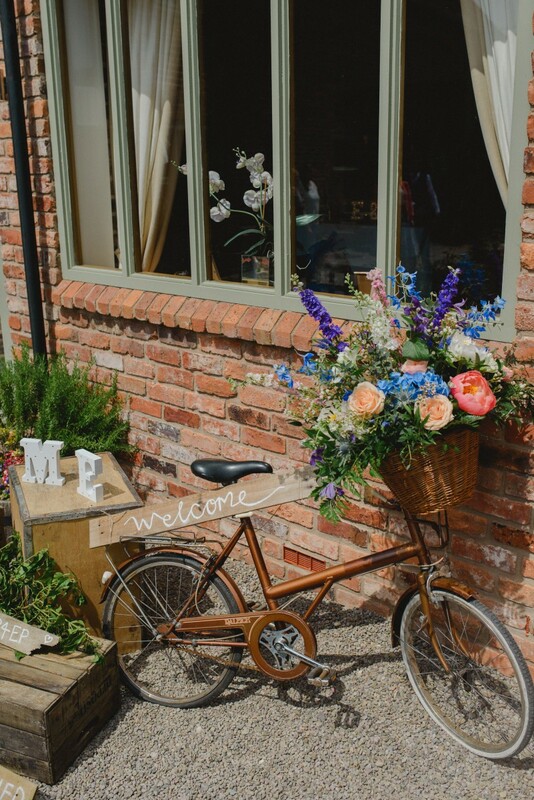 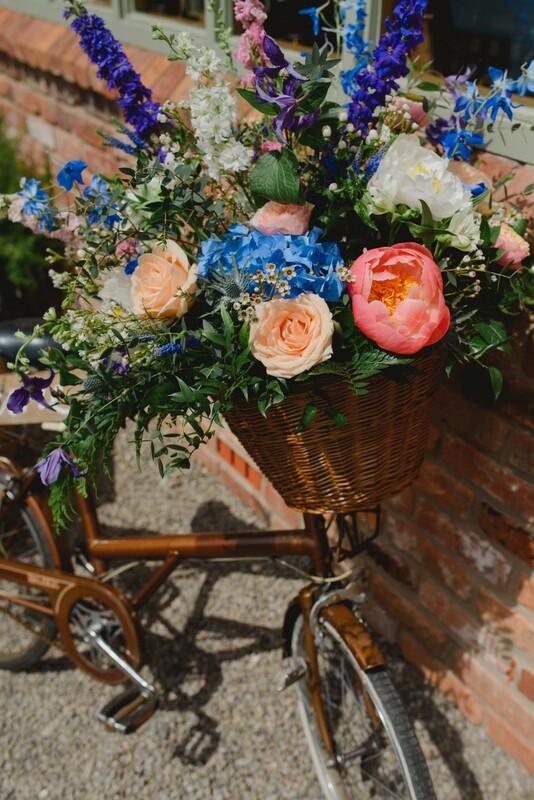 I also filled the basket of my vintage bicycle with flowers to welcome guests into the barns and decorated their cake with beautiful blowsy peonies. 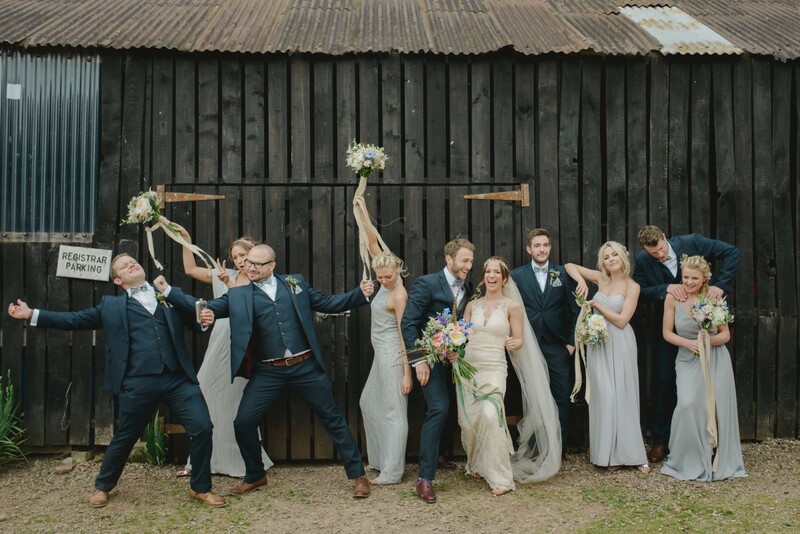 I just loved the colours and mix of wildflower style blooms in the wedding, not to mention the fun and love captured in these image, so I’ll leave you with a few more! 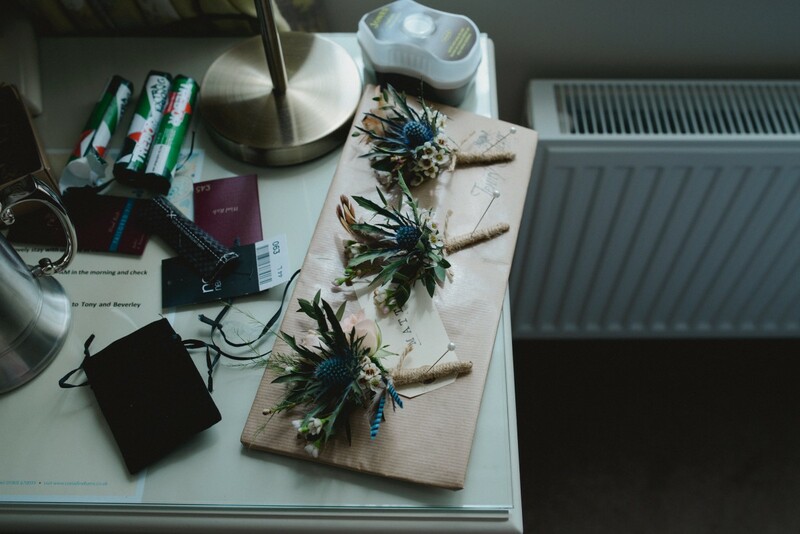 Ps you can see more from this beaut wedding over on the Costa Sisters blog here!! 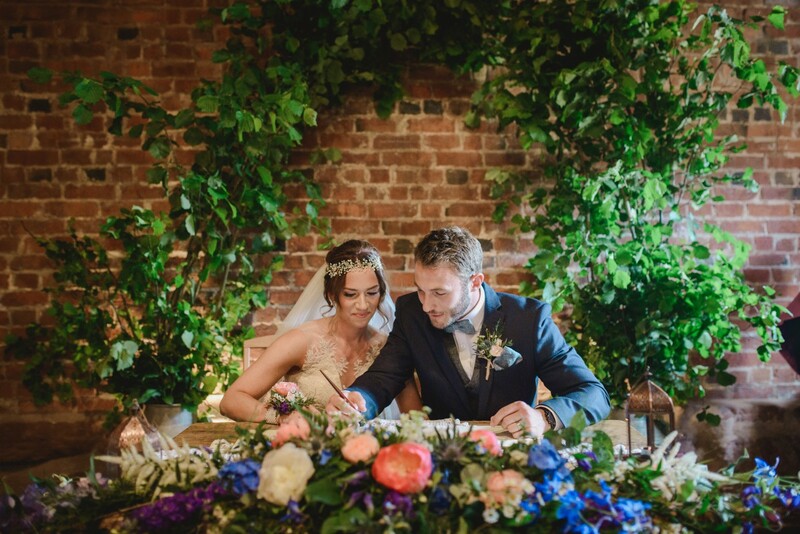 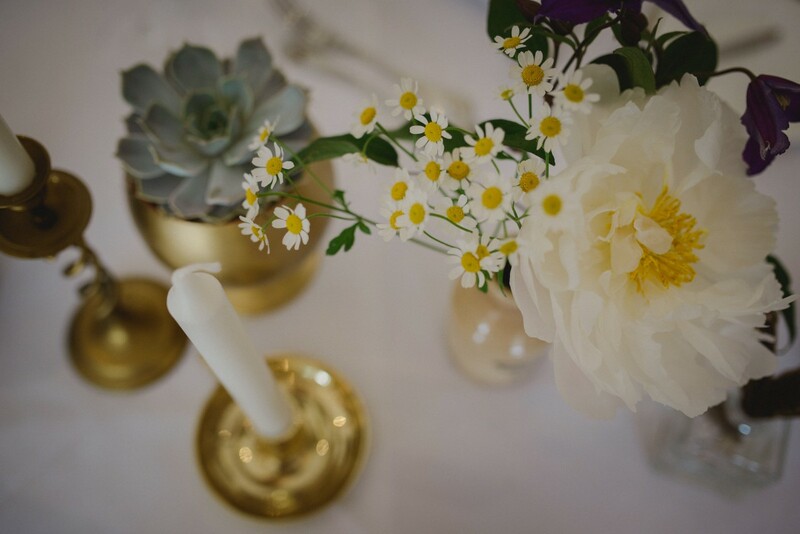 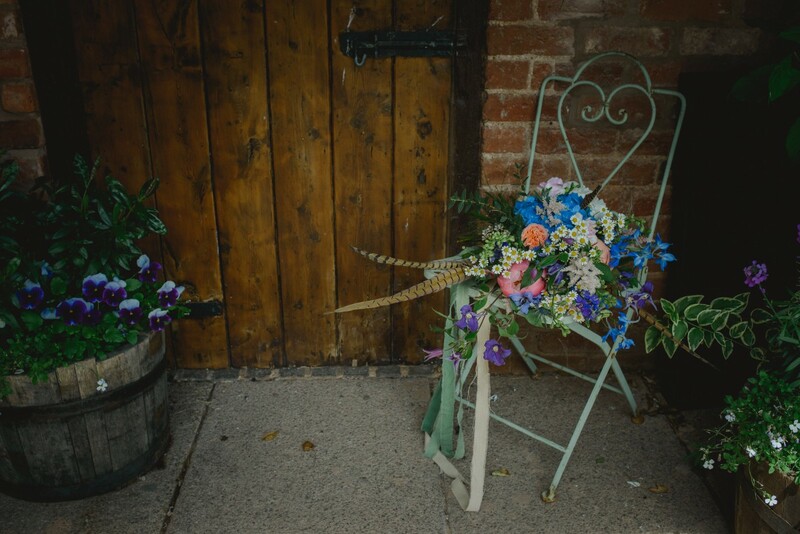 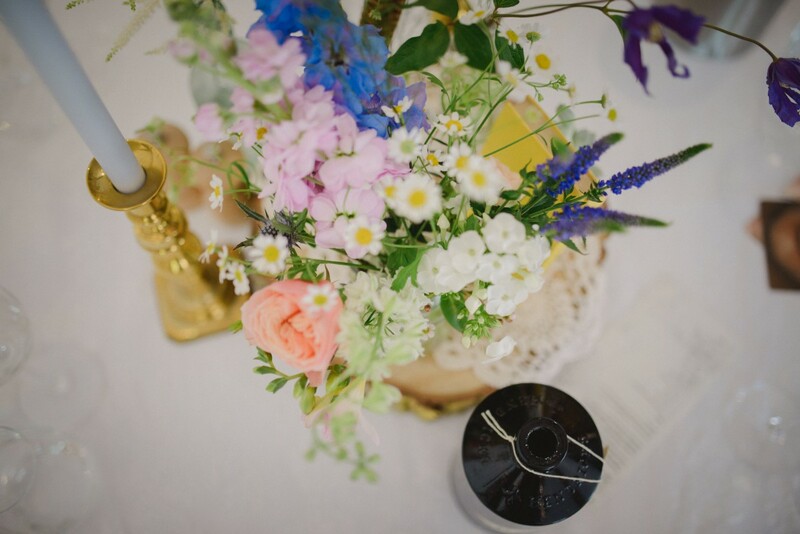 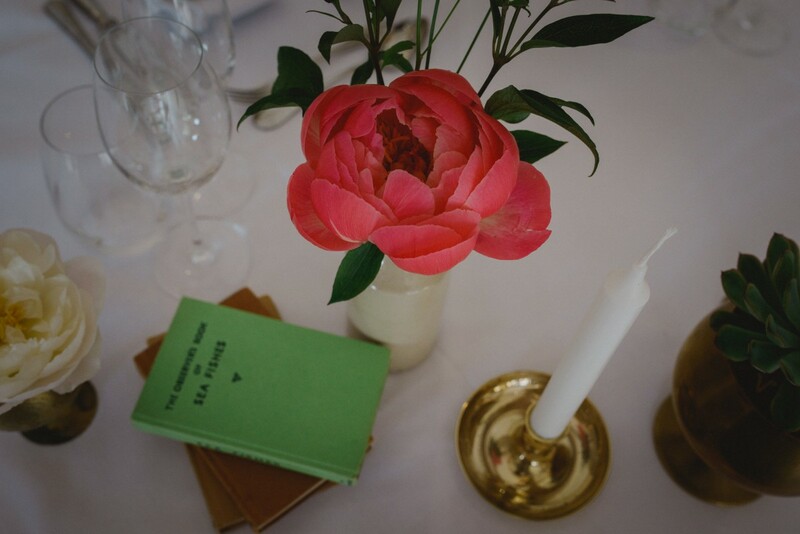 From my workshop in the Worcestershire countryside I create natural, seasonal floral designs for weddings using a beautiful range of fresh flowers, herbs and foliage. 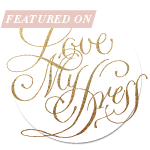 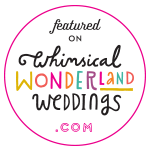 This is where you'll find images from some of the beautiful weddings I've worked on.